Providing you the best range of multi color offset printing machine, four color non woven offset printing machine and non woven bag multi color offset printing machine with effective & timely delivery. 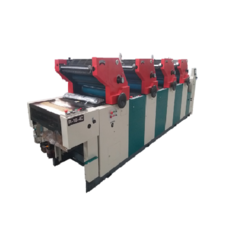 Our company is counted among the leading manufacturers, wholesalers, retailers and exporters of superior quality 4 Color Satellite Offset Printing Machine. These products are manufactured in compliance with the international parameters using cutting-edge technology and advanced machinery. Globally known for their hassle-free installation, simple functionality and minimum electricity consumption, offered products are widely demanded by the customers we have. Paper Size (inch) 18X24 MAX. Our clients can avail from us a wide range of Four Color Non Woven Offset Printing Machine. These printing machines have precise design and fabricated keeping in mind the requirements of patrons. Speed (IPH) 3000 RPH MAX.